The Lucas County Unemployed League was affiliated with the American Workers Party, a small radical organization led by A.J. Muste, which emphasized mutual support of employed and unemployed workers, and A. W.P. leaders played an important part in the conflict. When the strikers and unemployed blocked the plant gates with mass picketing, the employers got an injunction limiting them to twenty-five pickets at each gate. The Unemployed League, determined to "smash the injunction," continued picketing, and when leaders were arrested for contempt of court, hundreds of unemployed packed the courtroom and cheered and sang as the trial progressed. On May 21st, 1,000 gathered for a noon mass meeting at the gates of the Toledo Auto-Lite plant; next day 4,000 came to the noon rally, and the third day 6,000. At this point, Sheriff David Krieger decided, as he later testified in court, that the time had come to take the offensive. 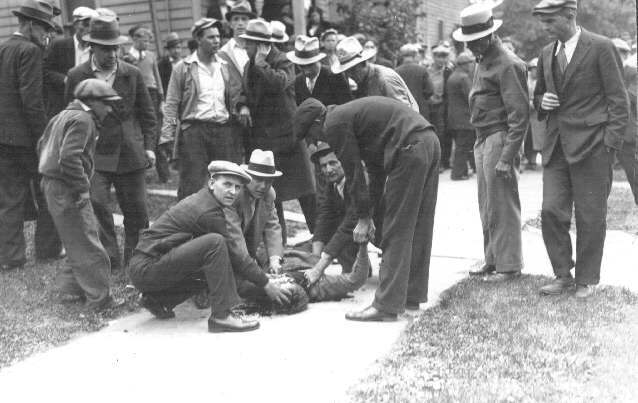 Unwilling to rely on the local police, who were disaffected themselves and sympathetic to the strikers, he deputized special police, paid for by National Guardsmen attacked the picket lines and evacuated strikebreakers from Auto-Lite plants, but were driven back by the crowds. Guardsmen advanced again with bayonets; they were ordered to fire. He then began arresting pickets, and a deputy began beating an old man in front of a crowd of 10,000 which had gathered. This was too much for the crowd, which proceeded to surround the Auto-Lite plant, holding 1,500 strikebreakers inside. The special deputies dropped tear gas on the crowd from the plant and attacked them with fire hoses, iron bars and some gunfire. The crowd systematically collected bricks and stones, deposited them in piles around the streets, and heaved them through the factory windows. Three times the strikers broke into the factory and were driven out in hand-to-hand fighting. The battle raged for seven hours. At dawn next morning 900 National Guardsmen, complete with machine-gun units, were rushed into Toledo from elsewhere in the state-Sheriff Krieger being unwilling to call up the local Guard. The Guardsmen evacuated the strikebreakers from the plant, but failed to intimidate the crowds, who stoned them and drove them against the factory walls. The Guardsmen advanced with bayonets. The crowd drove them back again, and were in turn pushed back with bayonets. As the crowd advanced the third time the troops were ordered to fire; they let go, killing two and wounding fifteen. Even this did not disperse the crowd, which attacked again that night and was again fired on by the Guard. Only the sending of four more militia companies to the plant-more troops than ever seen in Ohio before in peacetime-and the agreement of the companies to close down finally pacified the situation. Meanwhile, eighty-five local unions pledged themselves to support a general strike in sympathy with another dispute, growing from the demands of workers at the electric power company. The strike was headed off when the company offered a twenty-two percent wage increase and union recognition. Leaders of the unemployed were arrested and one was seized by the Guard and held incommunicado. With their plants closed, the auto parts makers finally agreed to recognize the union, grant a wage increase, and rehire the strikers. Rehiring proceeded slowly as the plants reopened until a crowd began gathering at the Auto-Lite gates and the company, fearing a renewal of direct action, rehired all the strikers at once. Excepted and very slightly edited from Strike! - Jeremy Brecher. 1. Roy W. Howard of Scripps-Howard newspapers to Louis Howe in the White House, cited in Bernstein, Turbulent Years, p. 221.